The Children in the Shoe provides high quality child care and early education for young children in Rockville, Bethesda and Olney. We specialize in the care and nurturing of these very young children. Toddlers are little learning machines! At this age your child may go from taking their first steps to charging across the room! They may go from working to form single words to putting together simple phrases. Such phrases often involve pointing and indicating something that your child may want. At this age we begin to focus on developing early communication skills emphasizing self expression. Our experienced, professional caregivers are carefully trained to help Your toddler feel safe, loved, and well-cared for. They understand the importance of talking to the children, making eye contact, singing silly songs, cuddling, and gently modeling positive reinforcement and communication. Your child will have a primary caregiver who performs all of the one-on-one caregiving routines (feeding, changing, comforting, etc) and with whom your child will form a bond of intimacy. Studies on early brain development stress the importance of a single, consistent caregiver for the majority of the day. This caregiver provides a written daily report detailing your child’s day. 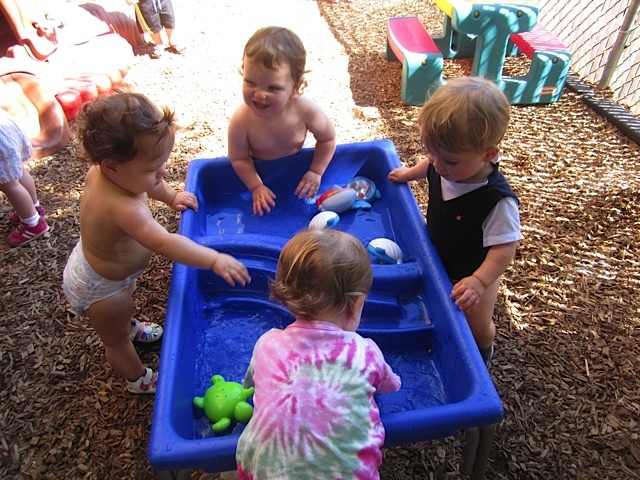 Our toddler environments are rich in materials which encourage exploration, active, interactive, and quiet play. Once young children develop a sense of safety and trust, we help them to become independent and self-confident and to develop social, language, and fine and gross motor skills. Daily routines include morning and afternoon snacks, bottles and/or sippy cups, lunch, hand washing, and diaper changes. Our toddlers are excited to begin napping on individually assigned cots. Daily activities include story time, music activities, outside time, and lots of play with age-appropriate toys. Toddlers do art activities each day, using a variety of materials. Special teachers visit the classrooms regularly to present activities and experiences in music & movement, sports & fitness, and foreign language exposure. We provide cots, sheets, blankets, bibs, sippy cups, utensils, snacks and milk and water. I want to schedule a tour. You will be contacted shortly. I just need info. Pricing and scheduling information will be emailed to you. Pricing and scheduling information will be emailed to you. William is just so happy to go to school each day, and that gives me a little glimpse into the joyful way he spends each day at the shoe. The teachers and staff at The Children in the Shoe are amazing! "I am writing to compliment you on the remarkable team you have in place at The Children in the Shoe. Nowhere have I encountered such a happy, competent and synergistic group. Teachers genuinely care about the children! "It's such a warm place where the teachers genuinely care about the children. The administration is responsive. I've used many daycares in the past with my older children and I can say that these positives are not everywhere." Our experience at The Shoe has been amazing! E-mail sent to us may not be secure. If you choose to send us an e-mail message, we may retain the content of the e-mail and your e-mail address. We do not share, rent or sell any information about visitors to our web site to any third parties. We only use information for our proper purposes.